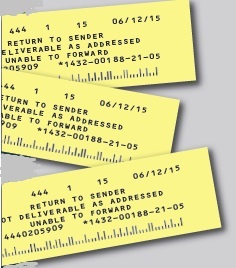 These are the result of using an endorsement on your mail such as Return Service Requested. If you do not use an endorsement, standard mail is simply discarded. In that case you could be mailing to bad addresses multiple times and not know it, wasting valuable postage and production costs. The post office now has a service that will eliminate both of these scenarios. By using their electronic Address Change Service (ACS) you can eliminate all physical returned mail. You need to put a new endorsement line on your mail – Electronic Service Requested. By doing so, your mail shop should be able to receive data directly from the USPS and make it available for you to download. Likewise, by using this endorsement, you can know which mail is being discarded so you can discontinue mailing to those addresses. In both cases you can update your database without laborious keypunching. The other requirement is that the IMBC (Intelligent Mail Barcode) needs to contain identifying characters that the USPS will detect as your mail is scanned.